Been awhile since our last post. Good thing is that there has not been much to report. Slowly being stepped down off the steroids and have also stopped the anti-seizure medication. Always good when there are fewer drugs involved! This is anniversary week (30th). We had plans to celebrate on the Carnival Magic, but with the recent diagnosis, had to cancel. Hoping this is just a postponement and we can go another time. Our friends (the Porters) came to visit for the week. 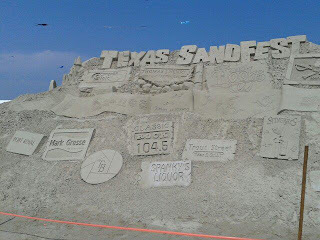 Last year we had attended the Sandfest and really enjoyed it. So, why not go again to Sandfest 2013? This year, we chose to go on Saturday instead of Sunday since the weather looked to be better. It was interesting to see the sculptors working on their creations. One last Texas treatment remains on Wednesday. Then the rest of the week is going to be just relaxing and visiting before we start back toward Ohio on May 4. Hope to see our hometown friends on May 9. We'll back up to Wednesday which was a scheduled (our only) appointment with our Oncologist. Everything looked good with the blood work, but couldn't figure out what was causing Connie's problems with her ears. Seemed to be clogged a lot. Scheduled an appointment with the Radiation Oncologist, who said that even though radiation treatments have stopped, the radiation is still working. One of the things they "tickled" was the main tube (that I can pronounce but not spell) and that's probably the culprit. We scheduled a visit to an Ear, Nose and Throat specialist. Sitting here now, hoping its not going to be anything other than needing a good cleaning. Connie did have some damage to her inner ear caused by the radiation, which prevent things to properly drain. Better now, follow up in another couple of weeks. Hard to believe it has been over a week since our last update. Good news it that there has not been a lot to report since then. The weather here in Rockport has been warm, but overcast. So, not much sitting out in the sun. However, that is good too since I am now supposed to limit my time in the sun. :-( Those that know me well, know that is going to be a challenge. We saw evidence why it is necessary when we were working outside (on an overcast day) and in no time at all, I was getting sunburned on the back of my neck. Sounds like the sensitivity will continue even after the radiation affects are over. One side effect that no one seems to be able to address is my ears. They said the tops would be sensitive and peeling like a sunburn, but they can't explain why I am having issues with the inner ear. Very annoying! Today was a visit to the medical oncologist. Sounds like the lab numbers were ok and we can proceed with the next dose of Herceptin in a week. Since all that has fallen in to place, we have more firm plans for our return to Ohio. Looks like we will be leaving Texas on or around May 4. It will take us at least a week to get all the way back to Ashtabula as we drive only short distances and will spend some time in Wilmington to visit the folks. Well, that's all I have to report at this time. Thanks for all the love and prayers! Yesterday was Connie's last whole brain radiation treatment. Now, its just a sit back and see how much good we've done which we won't know for another couple of months with an MRI done probably in Cleveland. When we're sitting at home here in Rockport at Copano Bay, you suddenly realize how much time those daily runs into Corpus Christi took. We're now pretty much going to do weekly runs now, with the next appointment with the oncologist next Wednesday, and the last Texas IV treatment the following Wednesday on the 24th. After a followup with the radiation oncologist on Friday the 26th, we'll be done with our spring Texas doctor visits. Because she's not having to do the whole brain radiation and using the mask (that was molded with a full head of hair), yesterday was also hair cut day. The hair was falling out pretty steadily so Connie got it cut all the way down and now we'll see (without the radiation) how much it starts growing back. I know she's a lot more comfortable with no hair, than with hair falling out all over the place. Labels: Cleveland Clinic, Copano Bay RV Resort, Corpus Christi, Doctor, hair loss. We had an up and down week this week. Connie's treatments on Wednesday pretty much knocked her down until mid day on Friday, even though we had a couple of runs into Corpus for Thursday and Friday treatments. Monday will mark the last "whole brain radiation" treatment which will be a welcome relief. 40 minute drive one way for a 15-20 minute treatment daily gets old. Tuesday is a meeting with the radiation oncologist, then a break until the following Wednesday when we meet with our oncologist. With all that news came word that Connie's last treatment in Texas will be on the 24th of April, with her first treatment in Ohio at the Cleveland Clinic on the books now for May 15th. 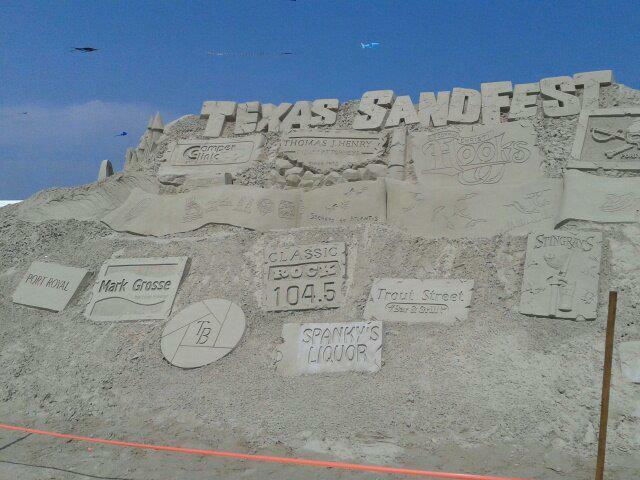 We have friends who would like to come to Sandfest at Port Aransas on Sunday the 27th. If they come, we'll probably leave for Ohio on the 4th of May. If they don't come, we'll probably leave here on the 27th or 28th depending on when we find out they're not coming. In the meantime, we're like last rig standing here at Copano Bay RV Resort. The program lists 146 sites; the girls and I walked around with a counter Thursday and only 43 rigs, not all of them occupied were still here. Wasn't like this in Portland at Sea Breeze RV Resort, but was like this in Tucson at Desert Trails. Unfortunately already hearing of tire and mechanical troubles for those who have left, and those who are going home to snow. Well, it was back to the grind on Monday. Started the last week of the whole brain radiation treatments. Yippee! Tuesday was a busy day. With the metastases in the bones, and one of the side effects of one of the drugs, the doctors want to add another drug (Zometa). However, before they will do that, a visit to the dentist is required. So, that appointment was today after the radiation treatment. Got the good news from the dentist that everything looks great. Today, Wednesday, started the "on again" with the chemo pill. Also, big day by starting the larger dose of Herceptin. And, with the news from the dentist, I get to add the new drug which is also administered via IV. After that, it was off to the radiation. All this was done by around 12:30PM. So, we had to have lunch. Joe's Crab Shack is conveniently located right on our way. And, we had a coupon! Once the tummy was full, the morning treatments started to catch up with me. Time for a little nap on the ride home. Pretty much was done the rest of the day. Not sure when Bob is going to get to rest. He has been working hard taking care of the business, the cleaning, the cooking, the dogs ~ just everything. Hopefully, once the radiation is done, I may be able to help out some more. Still working on getting everything in order for the trip back to Ohio. A lot of coordinating to do with all the various doctors involved. Hope to have more details pinned down this week.